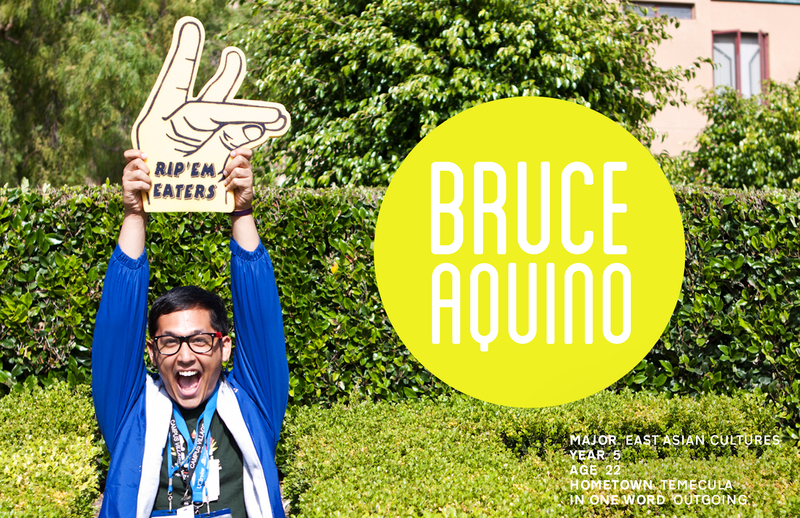 Bruce Aquino is all around involved across campus from housing to ASUCI to singing in an a capella group. 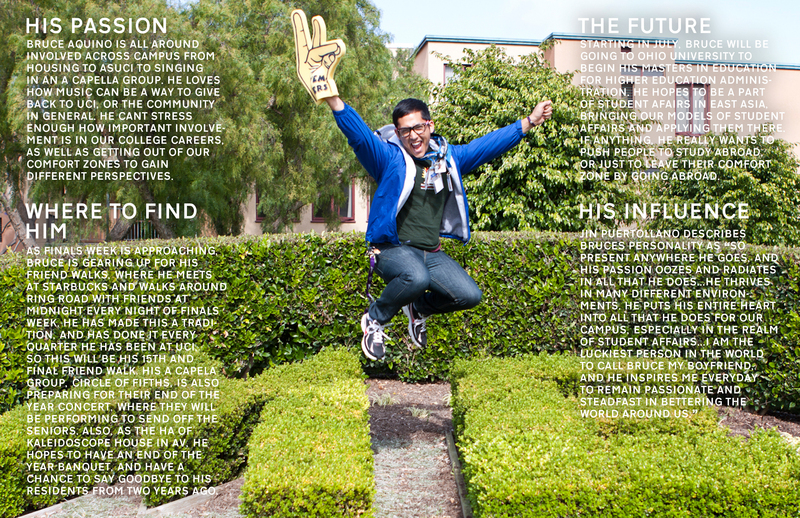 He loves how music can be a way to give back to UCI, or the community in general. He can’t stress enough how important involvement is in our college careers, as well as getting out of our comfort zones to gain different perspectives. As finals week is approaching, Bruce is gearing up for his “Friend Walks”, where he meets at Starbucks and walks around Ring Road with friends at midnight every night of finals week. He has made this a tradition, and has done it every quarter he has been at UCI, so this will be his 15th and final “Friend Walk”. His A capella group, Circle of Fifths, is also preparing for their end of the year concert, where they will be performing to send off the seniors. Also, as the HA of Kaleidoscope House in AV, he hopes to have an end of the year banquet, and have a chance to say good bye to his residents from two years ago. Starting in July, Bruce will be going to Ohio University to begin his Masters in Education for higher education administration. He hopes to be a part of student affairs in East Asia, bringing our models of student affairs and applying them there. If anything, he really wants to push people to study abroad, or just to leave their comfort zone by going abroad. BA: When I was about 7, I moved from Fairfield to Temecula, and I lived there until I turned 18, and then I went to UCI. After I moved to Temecula, I was homeschooled by my mom for five years – fourth grade to ninth grade. It was interesting because I thought I would turn out socially awkward. I guess I am socially awkward, but in a good way, if that’s possible. I think I’m awkward, but like in a funny way. From there, I went to a brand new high school. Being homeschooled for five years, I didn’t know what I was doing, in terms of school involvements and clubs, but I found what started my passion going through choir. I found it when I was a junior, because over the announcements during the first one or two weeks, they said that concert choir was looking for a few good men. I figured, I liked singing, and I thought it would be fun to do as a class. Through choir, I feel like I really found my niche and my passion for music. I didn’t really know that I was passionate about music – I loved to sing, but I didn’t know that it was an option for me to become a singer, until I found that in high school. From there when I came to UCI, I got involved in a capella groups. I was in a mixed a capella group – it’s not here anymore, but there were a lot of drama majors in that group. They all graduated, and I was left alone, so I joined Circle of Fifths when I was a third year, and the past two years I was the Vice President and Business Manager. BA: I got really involved in housing. My first year, I was an active participator of Community Council, and from there, for my second year, I became a Community Programmer in Middle Earth. I loved being part of housing so much that I applied to be a Resident Advisor my third year, and I was honored and lucky enough to become the RA of Isengard in Middle Earth. That year, I decided what I wanted my future job to be in – higher education. I really loved student affairs in general, but I didn’t realize how much I loved student affairs until my fourth year, when I joined ASUCI, and became part of legislative council. I wasn’t a nominated position – I was the Secretary and Legislative Liaison. Starting my fifth year, I became an At-Large Representative for one quarter, and I was also elected to be a speaker pro-tem. Essentially, I led and directed legislative council, which was a crazy experience. When I was a third year, I also joined Westminster Chorus, which is outside of UCI. It’s an all-male barber shop chorus. Through the chorus, I was able to go places, and experience new things. I’m a native Californian, but for the most part other than taking family trips, I never really left the state. I was able to go to different states, like Philadelphia and Kansas. While I was in Westminster Chorus, we won an international title for barbershop. I was really humbled by that experience, because not a lot of people can say that they have a gold medal in something. When I was 15, that was something that I never would have thought I would have achieved, even just becoming a higher level singer. I was really shocked, but really happy. During last quarter, I was able to go to Europe with Westminster Chorus. We were there for a week, and we sang in the UK, the Netherlands, and Germany. It was really amazing to share music with people across the world. It gave me a perspective in the sense that we as Americans take things for granted. I got to see the people in Europe just sit back, relax, and enjoy the music, whereas Americans are rushing everywhere and trying to get things done. It was really interesting being in that environment. I mean, we live in Irvine, the safest city in America, and so I was able to see that perspective. I was a SPOP staffer last summer as well. For me, SPOP was a good mirror; a good reflection. It let me know what is important on campus – it’s not the clubs or the organizations that we’re involved in. When it really comes down to it, it’s the struggles and success that we make throughout our college experiences. So it was good to give the tools to the incoming freshmen on how to get those successes, and how to deal with struggles they may face. I think SPOP was really good for me in that sense. I realized that I was getting caught up in all my involvements, but it was really nice to go back to ground zero, and it was a good reminder of what’s really important – our education. BA: Everyone. Whether it’s negative experiences, or positive experiences, they really end up shaping who you are. Definitely my mom, my sister, my grandma, and my dad. Also, my friends. They’re my support system. I know I can always fall back on my family, but I don’t like to burden them with my problems. My friends are always there to say something supportive, and they also keep me grounded. They’re there to pick me up when I feel down, and they’re also there to pull me back down when I get high on life. I would also say professional staff. No matter what department they’re in, whether it’s Sandy Jones, the executive director for ASUCI, or my current boss, who’s been my boss for 4 different jobs. No matter who it is, the people who work in student affairs are always there to keep you going, keep you on the track to graduate, and help you grow as a leader. For my mom and my sister, they support me in whatever I do. I don’t know why they do it sometimes when I get involved too much, they still support me. My mom lives in San Diego about an hour and half away, and has probably made a trip here to Irvine hundreds of times to help me. I don’t know what I would do without her, and I can’t believe she’s so willing to go out of her way to help me sometimes. I really appreciate it and I love that about her. My sister is always helping me. She interviews me before I have my interviews, so I know what to say or know what not to say. And I can’t forget one of the most influential and inspiring people in my life – my boyfriend. Jin Puertollano is one of the most thoughtful and caring people you could ever meet. He constantly questions and reassesses EVERYTHING. He fights for what he believes in with all his heart and he stands up for those who cannot. I aspire to live by his example in which he raises up others and values them for who and what they truly are, individuals that deserve to be cherished. BA: Definitely music and UCI undergraduate housing. I’ve worked in housing for four years. I’ve been a Community Programmer, a House Assistant, a Wellness Coordinator, and a Resident Advisor. I’ve worked in three of the four on campus communities – Middle Earth, Campus Village, and Arroyo Vista. I really wanted to work in Mesa Court, but that’s okay. Music, for me, was a really good way to give back to UCI – through singing. There was this one time where this guy wanted to propose to his girlfriend, and we got to be part of it. I love music. It enabled me to leave my comfort zone. It got me to Europe, and I think next year we’re going to Canada. I’ve never been so many places in my life, and it’s just really eye-opening. KS: When you were six years old, what did you want to be when you grew up? BA: I think when I was really little I wanted to be a Power Ranger. I wanted to go around fighting evil. After that, when I was around 8 or 9, I was on the path to becoming a child actor. I was in film acting school, and I used to go to LA. I could have been a Disney star, or something like that – that would have been funny. Somewhere down the line, I think I forced myself to have stagefright. It was an intimidating experience. And after that when I grew up to be a little bit older, I really wanted to design video games. I had talked to my mom, and I was going to go to this school in Washington, and then get an internship at the Nintendo Headquarters nearby.